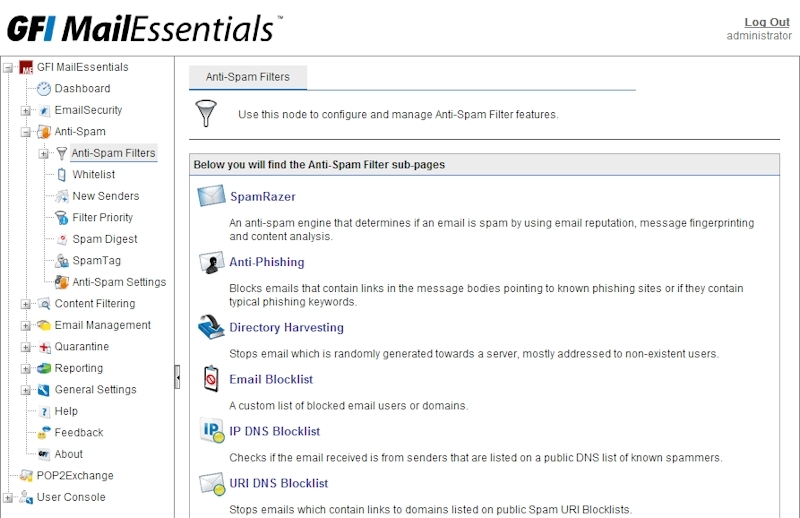 GFI MailEssentials is an award-winning email security and anti-spam software solution for Exchange Server and other mail servers which protects your network against email-borne viruses and other malware threats using up to five antivirus scanning engines and advanced email filtering technologies such as two frequently updated anti-spam engines that require no tweaking IP reputation filtering greylisting directory harvesting attack protection and more. 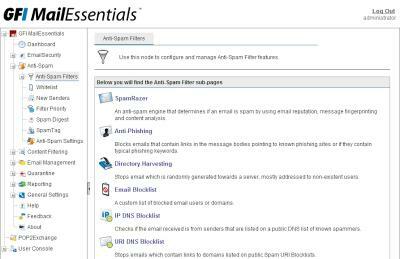 With a spam capture rate of over 99% and zero false positives IT administrators can rest assured that company email is secure and spam-free. GFI MailEssentials puts control in the hands of the administrator and user with a central web-based email management dashboard email reporting tools and a SpamTag Outlook addon.GFI MailEssentials also adds various email management tools to your mail server including email disclaimers email monitoring and redirecting based on custom rules email reporting list server server-based auto replies and POP3 downloading.